A big thank you to the fifteen or so members who met up on Monday 21st October 2018 to add details to our draft next year's programme (see below). In addition, at our October meeting, we had agreed to visit some other gardens in order to inform the 2020 programme. Historic landscape gardens featuring ponds, streams, cascades, rocks and woodlands, incl fine trees, bluebells in spring, ornamental walled garden and private garden at Lemarne. Ongoing development of C19 American Garden. Allow at least 1 hour for a circular walk. Some steep and rough paths, which can be slippery when wet. Stout footwear advised. Local, free, lots of stalls and helpful people manning them. It's an outreach venue for Chelsea. The garden is open for charity too for £5, a bargain price! Lovely garden and great woodland walks. 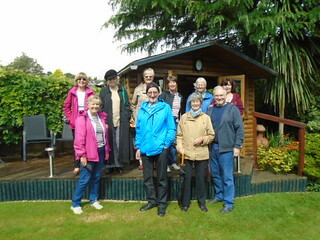 Twelve members of the group met up at the Community Centre Car park at 9.00am to travel to Tregothnan by the Lerryn Area minibus. It was a cold, overcast and blustery April morning and we had had to wrap very warmly, retrieving from our respective wardrobes clothes that we had put away until next winter! Tregothnan, home to the same family since 1334, has the largest historic garden in Cornwall. Although not open to the public you may, with prior appointment, visit this amazing garden. However, the cost is £65 per person. Fortunately, Tregothnan opens its doors once a year for a Charity Week-End at a more affordable cost of £10. The gardens boast ancient Camellias, mountainous Magnolias and the biggest Rhododendrons in the world. It is an official safe site for the keeping of rare or endangered trees from all over the world, holding some Red Book endangered trees which are larger than any remaining in the wild. Millais wrote in 1924 that Tregothnan was probably the premier garden in the UK and growing species otherwise only found on the Scillies. It is home to the Wollemi Pine- a prehistoric species through to be extinct until 1944 when it was discovered in a remote Australian Valley. A prized specimen now grows in the garden overlooking the Southern Hemisphere Collection. Manuka trees introduced in 1880s, responsible for the Tregothnan unique Manuka tea and the only honey of its kind outside its native New Zealand. A Camelia Maze, the largest in the world which we enjoyed walking into and succeed in getting out of! A bowling green – not a patch though on the green at the Lostwithiel Bowling Club! There are several viewpoints at the edge of the garden and several seats with beautiful vistas but today was not the day to stop moving for very long. We enjoyed our refreshments in the courtyard but after three hours we were ready to leave as the weather had not warmed up. It was the first visit Tregothnan for all but one member and despite the disappointing weather, the visit was enjoyed by everybody. Fourteen of us met up at Bodmin Nurseries for a one-hour guided tour by owner Mark. The nursery stand on the site of the Laveddon Mill, a water mill dating from the 17th Century. The remaining building is Grade ii listed. Although the mill was part of the Lansallos Estate, it was autonomous. It was a gristmill producing animal feed and there were other industries on the site (sawmill etc.). Milling took place until the early 1920s. In the 60s-70s, the site had become a hub for people growing and selling vegetables. There has a been a plant nursery on the site for 50 years and Linda and Mark have been running it for 19 years. This nursery is 90% self-sustained, employs 44 people, including the staff in the café which opened 6 years ago and continues to expand. The nursery has its own water supply which is rich in nutrients, thus reducing the need to use fertilisers, and it generates 60% of the electricity it uses. They grow shrubs and trees off-site, including the recently planted 10,000 Christmas trees which should be ready in 2027! The nursery charged £30 for the whole group and the money will be donated to the Bodmin Hospital. We had our customary refreshments in the Mill Cafe after the guided tour and, as the weather was so glorious, we sat on the patio area. There was also time to do some shopping. We look forward to our next visit to the Nurseries which will have a specific focus. It could be a focus on composting or on making hanging baskets. We will decide at our October planning meeting. 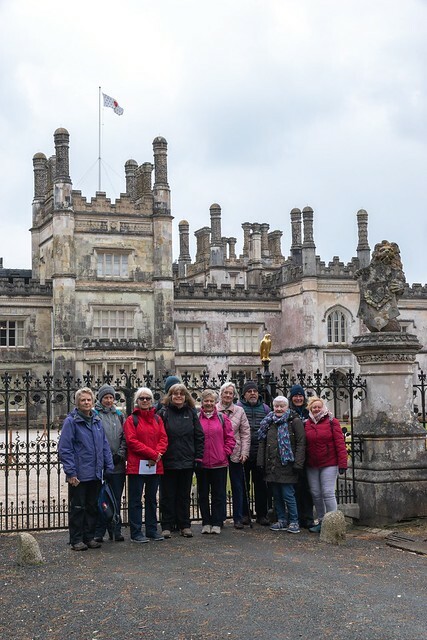 The group had already visited this local garden two years ago in the summer, but we had selected it again as our snowdrops garden to kick start our 2019 programme of visits. 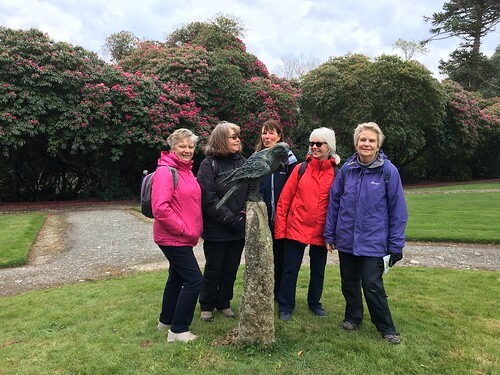 It was a disappointing start: five members had signed up for this visit but in the end only three of us turned up at the Lostwithiel Community Centre car park to travel to the garden. What a shame as the visit turned out to be an absolute treat with so many different varieties of snowdrops still in bloom. We were also blessed with lovely sunny weather. Nationally there are about 2000 different varieties of snowdrops and Tricia has 150 of them in her garden. Tricia had just come back from a snowdrops fair in Somerset where she had purchased more varieties of snowdrops and, as they were still in their pots on a table, we were able to examine each in detail, observing their individual features. We looked through the Avon Bulbs catalogue recommended by Tricia (other catalogues are available!) and were surprised to see the price reached by the snowdrop bulbs: up to £120 per bulb! However, we were informed that bulbs can fetch as much as £750. Tricia then gave us a guided tour of her garden when we saw her beautiful snowdrops blooming in flower beds, under trees and in the fernery. Galanthus nivalis is the best-known and most widespread representative of the genus Galanthus. It is native to a large area of Europe, stretching from the Pyrenees in the west, through France and Germany to Poland in the north, Italy, northern Greece, Bulgaria, Romania, Ukraine, and European Turkey. Although it is often thought of as a British native wild flower, or to have been brought to the British Isles by the Romans, it was probably introduced around the early 16th century and is currently not a protected species in the UK. Trumps - In galantho-speak, this is an “inverse poculiform”, where the outer segments have taken on the shape and markings of the inner segments. We bought snowdrop bulbs (the highest price was £10), gave Tricia a donation for the charity MIND and drove back to Lostwithiel where we stopped at the Q café for afternoon tea/coffee and cake.